Kids Making a Difference - Join Us! 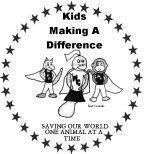 We'd love to have you join Kids Making A Difference and help us to Save the World, One Animal at a Time. No membership fee is ever charged making KMAD accessible for any child to participate. If you're under the age of 18, be sure to have your parent/guardian fill in the permission section of your application. Thank you for your interest in joining, and we will be contacting you soon!